Lot 576. L. Cupiennius. 147 B.C. AR denarius (17 mm, 3.34 g, 9 h). Rome. 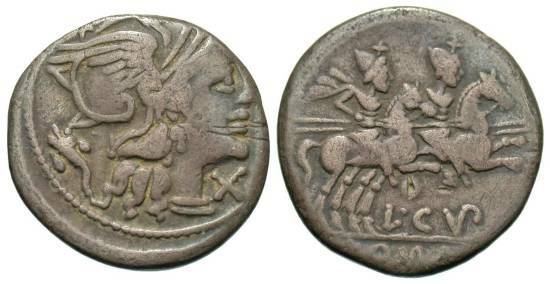 Head of Roma right, wearing winged Phrysian helmet; to left, cornucopia; to right, X / L CVP / ROMA, Dioscuri charging right on horseback with couched spears. Crawford 218/1; Sydenham 436; RSC 1; RBW 937; . Deeply toned. Fine.